Saint 21: ToughMFs...for the love of Rock 'n' Roll. ToughMFs...for the love of Rock 'n' Roll. only for 1 reason and 1 reason only...for the love of Rock 'n' Roll. 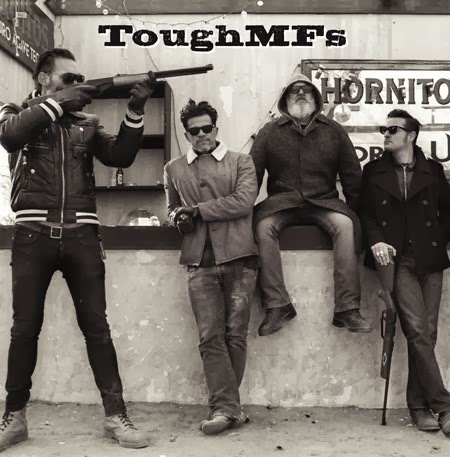 The ToughMFs are 4 friends based in Southern California and they got together to record these 2 blistering tracks for HepTown Records. The session was recorded live at the legendary studio, Rancho De La Luna, in Joshua Tree, California on Saturday 12th January 2013. Dean Micetich from The Black Tibetans handles the vocals and lead guitar, Dave Catching from Queens of the Stone Age, Masters Of Reality keeps the energy sky high with second guitar, Brian BOC from Eagles Of Death Metal drives it all along on the bass guitar and Joey Castillo, also from Eagles Of Death Metal, Queens of the Stone Age and Danzig ties it all together with his pounding drum beat! If you love Rock 'n' Roll...you will love this record.